Abused by fans, mocked on Twitter by players, frequently derided by managers and under constant scrutiny from every conceivable television camera angle, the life of an English football referee can be a tough and unforgiving one. Mark Clattenburg, Phil Dowd, Peter Walton, Howard Webb, Anthony Taylor and Martin Atkinson are just a few of the officials to have incurred the wrath of almost every Premier League manager, from Harry Redknapp and Kenny Dalglish to Mick McCarthy, Tony Pulis and David Moyes. Stoke boss Pulis was so angered by Atkinson's performance in his side's 2-0 defeat at Sunderland in November that he called for the introduction of a promotion and relegation system for referees in an effort to reduce the number of poor decisions. "If the top three [referees] in the Championship got the opportunity to work at the top level, I think it would certainly clear a few referees' minds," said Pulis. His suggestion was not taken too seriously at the time but his outburst only served to highlight the growing disillusionment with the standard of officiating in English football's top flight. For the record, there is no such thing as a league table for Premier League referees, who number 16 and have responsibility for officiating 380 top-flight matches over the course of a season. So how are they judged? And who is responsible for ensuring they are up to the job? Assessors monitor how referees perform, while the Professional Game Match Officials Limited (PGMOL), the board tasked with the responsibility of developing excellence in officiating in the English game, works closely with football analysts Prozone to provide constructive feedback to referees and help improve their decision-making. 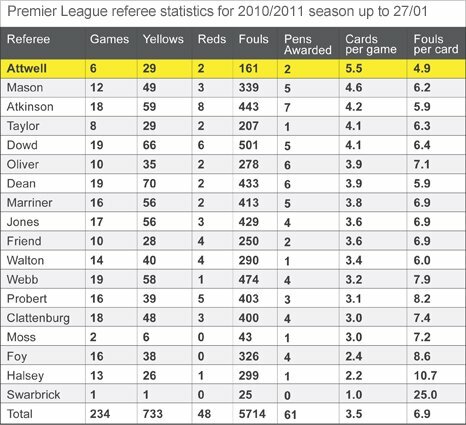 According to a Premier League spokesman, English referees are performing pretty well. He claimed that the number of offside decisions they get wrong is "extremely low" and told me that overseas football associations frequently use English referees to help train their own officials. Former top-flight referee Dermot Gallagher agrees that English officials are doing a good job, insisting they are getting the "key decisions right", while Alan Leighton, national secretary of referees union Prospect, says that any underperforming referees soon find themselves under the microscope. "Officials are assessed in a number of ways and their decisions are assessed and evaluated," he said. "A top official who does not get most key decisions right on a regular basis will find that they get into difficulty with the evaluation and assessment system. He is likely to be demoted." Still, not everyone is convinced that all referees are up to scratch. Stoke compiled a dossier on Mike Dean after he sent off two players during the early rounds of last season. When the official was then tasked with taking charge of their game with Tottenham on 20 March, the club attempted to have him replaced, presenting their dossier to Mike Riley, the general manager of PGMOL, as evidence. 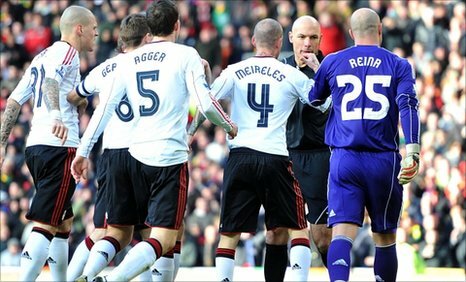 The approach failed and when Dean showed a red card to Dean Whitehead during a 2-1 defeat to Spurs, Pulis went ballistic. The Premier League refuses to publish data about referees but sports data company Opta has provided the BBC with statistics that shed a little light on their performances. There is basic information about the number of yellow and red cards, fouls and penalties that each referee has awarded over this season and the previous two campaigns. 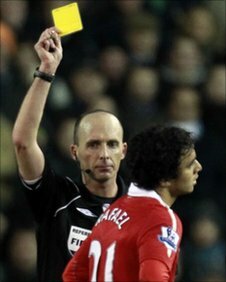 But Opta also provides data that suggests younger referees dish out more cards per game than their older counterparts. Statistics only tell part of the story, though. Opta can tell us what decisions referees have made but not if those decisions were right or wrong. And Opta does not record incidents that officials have missed altogether. Other sports have taken significant steps to help improve the decision-making of officials. Rugby Union and Rugby League, tennis and cricket are using technology on an increasingly frequent basis. Cricket's decision to introduce the Umpire Decision Review System has certainly paid off, with the percentage of correct decisions rising to nearly 98%. Yet football continues to lag behind, leaving referees and their assistants to rely solely on their eyes and ears to make judgments. If the performances of referees infuriate managers and players week-in, week-out, they have also become a growing concern for many football fans. Two Arsenal supporters - a computer expert and a qualified Belgian referee - have produced some detailed and interesting research on English referees. The computer expert, who goes by the name of 'DogFace', said his data "suggests referees exhibit a bias" and added that "it matters not if this bias is intentional or subliminal, it is there". He also insisted his data is "light years ahead of anything else in the public domain" and claimed that the only other place where analysis of this type is taking place is in the "realms of the gambling syndicates, professional gamblers and market makers". "Any edge they [the gamblers] find, no matter how small, has a substantial value attached to it and will be guarded with utter secrecy," he said. 'DogFace' even suggested punters bet solely on which referee is chosen to take charge of a specific game. Professor David Forrest, an academic specialising in the analysis of the sports and gambling industries, believes the work of 'DogFace' deserves further investigation. "I'm a little surprised at how points-per-game records differed across clubs depending on which referees' set of matches were considered. "He has provided enough data to indicate the issue needs investigating further with formal statistical analysis." 'DogFace' provides statistical analysis of referees ahead of Arsenal matches for the Untold Arsenal website. Belgian referee Walter Broeckx also works for the website. He provides post-match video analysis of each game Arsenal play, marking officials on every decision they have made as well as making a note of the decisions they fail to make. Broeckx concludes that English referees are getting only 62.75% of decisions right in matches involving the Gunners. That figure rises to just under 70% for Champions League games, which are refereed by officials from other European countries. According to Broeckx, Clattenburg is the top English performer, scoring 93 points out of 100 for his performance during the Premier League game against West Bromwich Albion. Chris Foy and World Cup final referee Webb do not fare so well. They are joint bottom of the Belgian's table, amassing only 40 points respectively for the home game against Fulham and the away match at Manchester United. "Bias is normal human behaviour," said Broeckx. "Would I be unbiased if I referee an Arsenal game? I would try not to be but I doubt I would succeed." Premier League referees have often been accused of favouritism towards the 'Big Four' of Arsenal, Chelsea, Liverpool and Manchester United. Pulis, you might not be surprised to learn, is not shy in voicing his opinion on the subject. "There is definitely a bigger split of decisions that go for the top clubs," he said. "Whichever way you cook it, whichever way you don't cook it, I think that happens." Interestingly, former referee Graham Poll has said he understands why Pulis and others think that way. "Now I'm out of the game, I can see how they feel that there is bias against their team and in favour of the bigger teams," he said. Let's look at what statistics tell us. 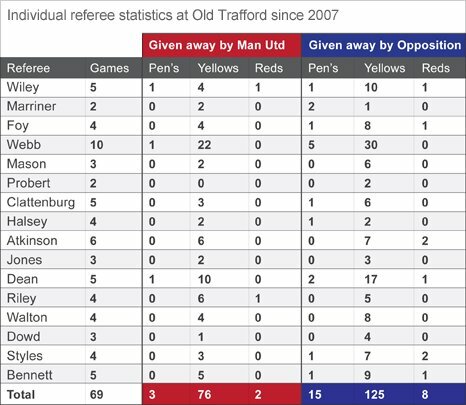 Since the start of the 2007/8 season, 15 opposition players have been sent off against Manchester United at Old Trafford, while only three home players have been dismissed. And as far as penalties go, opposition teams have given away eight at Old Trafford since 2007, while United have conceded only two. And what about the Premier League champions? Six Chelsea players have been sent off at Stamford Bridge since 2007, twice the number of opposition players who have received red cards, while the Blues have won 18 penalties, six times the number of spot-kicks won by visiting teams. "Teams that visit Old Trafford or Stamford Bridge would normally come as underdogs and adopt a defensive strategy and would statistically commit more fouls," said Forrest. "Bear in mind it might be a question of inconsistency rather than bias. Particular referees may take sets of decisions in all matches which are lax in protecting teams of great artistry and therefore they will do badly under that referee." 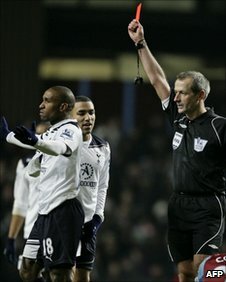 Here's an interesting thought for you... a 2007 academic study reached the conclusion that home teams received less favouritism from the referee when fans were separated from the pitch by an athletics track and therefore unable to exert so much psychological pressure on the person making the decisions. West Ham United may want to rethink their plans for the Olympic Stadium given the Hammers want to retain the track after the Olympics. But how can referees avoid charges of bias? Broeckx has some interesting suggestions, the first of which is quite radical. He believes the Premier League should only use foreign referees. And if that is too big a step for English football to take, then he suggests increasing the number of referees in the top-flight pool. "Such a small number of referees is really outrageous," said Broeckx. "It means that a referee will take charge of some teams five or six times in a season. "This is bad, both for players and referees. Too much familiarity is a bad thing." Broeckx would also like football to embrace the challenge system used in tennis, which allows players to contest a decision if they think it is wrong. PGMOL is open-minded about the use of technology in football, insisting referees "would welcome anything that would improve decision making". However, it opposes the idea of referees being forced to explain their decisions to the media. The German Bundesliga does things differently. After each weekend a panel reviews and publishes each referees' key decision, whether it was given or not, and grades them as right, wrong or uncertain, while German officials may also talk to the press after games to explain crucial decisions. However the PGMOL is adamant it will not follow such an example, partly because some decisions are referred to the Football Association's disciplinary process for examination. "It would only benefit the 24-hour news media and not the referee's decision-making process," said a PGMOL spokesman. "The media would only be interested in speaking to referees about negative decisions. It's important to remember that referees are not professional media operators." Not everyone shares the view that referees should be spared the glare of the media spotlight. Leighton offers a more conciliatory position. "I believe that referees would like a greater freedom to explain their decisions after games," he said, although he added that it was important any discussion "did not become a full post-mortem". Whatever happens in the future - and, who knows, football might end up embracing technology as other sports have done - criticism of referees is unlikely to subside completely.